This 1500-square-foot newly renovated CHAC-HA condo is located in an exclusive, gated community just 45 minutes from Cancun. Playa del Carmen is the fastest growing tourist destination in Latin America. The condo is adjacent to the first tee of the Robert Von Hagge, 18-hole Championship Golf Course. You are only steps from paradise... the blue Caribbean Ocean and the incredible white sandy beaches. You will enjoy your little touch of paradise relaxing on the patio with your favorite drink while listening to the sounds of tropical birds. From the patio you can watch golfers tee off from the first tee or people (or your kids) swim in the condo pool. You can spend your day in paradise at the beach, playing golf, snorkeling at Cozumel, exploring the Mayan Ruins, jungle tours, horseback riding, or enjoying one of the Eco-parks of Xel Ha and Xcaret. Evenings in this paradise setting are just as exciting, by taking a 15-minute walk past Mayan Ruins you will be in the center of town where all the action is. You can take advantage of the dozens of excellent and inexpensive restaurants and bars on Playa del Carmen's popular Quinta Avenida (Fifth Avenue). You can spend the evening eating, drinking, listening to music, and dancing. What makes my condo different from the other condo rentals? I love to vacation at mine!! We all want our vacation to be a wonderful experience with all the comforts of home coupled with the pleasures of a tropical resort. This condo has pollished marble floors throughout with hand crafted furniture. The condo has HIGH SPEED WIRELESS INTERNET, tropical ceiling fans, top of the line washer and dryer and appliances. The second bedroom has 4 adult sized bunk beds and there is also a queen size Murphy Bed if needed. There is upgraded digital thermostats in each room making it easy to read and set the temperature. We loved the condo. This was our third visit and it gets better every time. We loved all the details. Hope to be returning soon. A wonderful homey place to stay. Everything you need is there and it is in walking distance from everything! Great place! You were wonderful guest and will always be welcomed! Thank you for staying at my condo. This is our third consecutive year staying in Donna's Chac Ha condo. We absolutely love the location directly across from the Reef Resort. 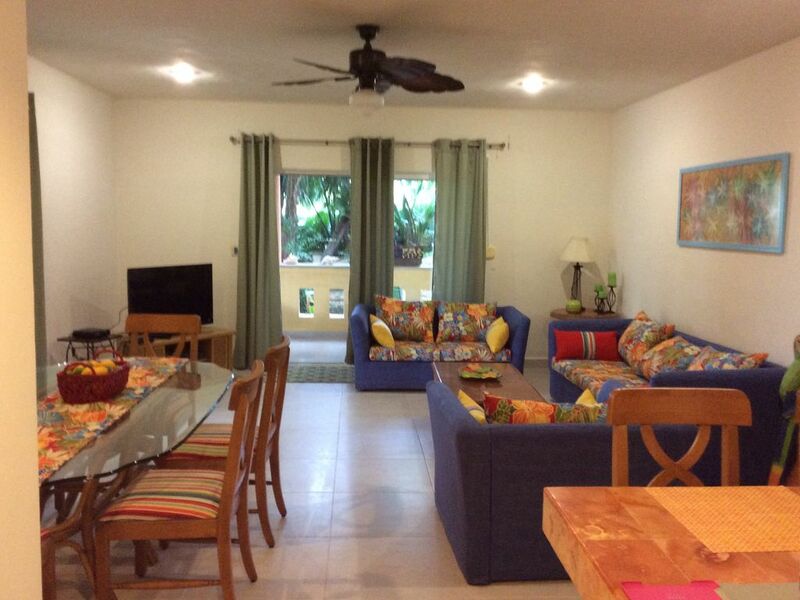 The condo is clean, bright and comfortable and there is direct access to the pool. And best of all, for us, no stairs! The kitchen is roomy and very well equipped for those who enjoy cooking, like us. We appreciate the quiet at night too. We will most likely be back next year! My husband and I enjoyed our stay at Donna's condo immensely. There was much updating and new appliances and cookware to use. We met many wonderful people around the pool when we weren't at the beach during our long stay. We even did a one day inclusive at the Reef with our friends. We hope to return for a third time! The condo suited our lifestyle perfectly. Close proximity to the beach through a gorgeous resort was lovely and the other amenities provided, like yoga were appreciated. We loved being on the shady side of the complex with direct access to the pool area and gardens (no stairs). Views out to the golf course were lovely too. The short walk to downtown was shaded and safe. We even walked home on a rainy night and got wet. It was quite romantic! We made friends with other travelers at the condo complex which made it very homey. We will be back! My family of 8 adults spent a week at Donna's condo over New Years. Even though it is just a 2 bedroom, we were all very comfortable. We would pack a lunch and spend all day at the beach. We would either access through through the Reef Club, or if they were full, walk down to the public access. Evenings, we would walk down to the shops and restaurants on 5th Ave. Even though it would be dark, we never felt unsafe. The condo was stocked with all that was needed to make it feel like home. The pool and grounds were beautiful and clean. The condos were quiet. We did have a car and were able to drive for groceries and to see some of the sites farther away, but you could get by with out one. Donna was very helpful before and after our trip providing information and answering any questions we had. Our family had a wonderful time together and made memories that we will cherish forever. I would highly recommend this condo and hope to return to it as well.